with thunderclouds flared lightening wildly in the distance. It was early afternoon. My father, the Lighthouse Keeper said it looked like a bad Northeaster was blowing in and we&apos;d better make ready for the coming severe storm. 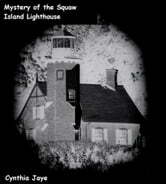 Fog and rain began moving onto the island at sunset and father sounded the steam foghorns at five-minute intervals. I was taking a walk near the wharf to watch the storm, when my mother began calling me to come in. I slipped on the jagged rocks and was swept into the lake by giant waves. could she write this if she didn&apos;t survive?" she whispered. Kirsten and Aubrey, best friends and lighthouse buddies are off to Squaw Island, Michigan. This time, they discover mysterious footprints and see odd lights in the lighthouse at night while other totally unexplainable events keep happening that the girls cannot explain nor prove to Kirsten&apos;s parents. 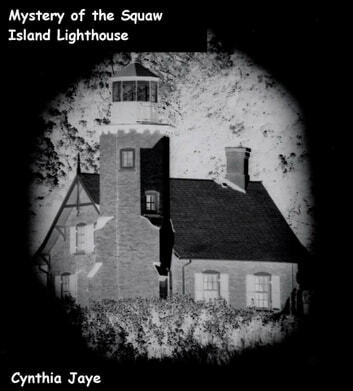 This short mystery, intended for children aged up to twelve years old or so, contains information about real lighthouses in Michigan, USA. Set at Beaver Island, and nearby Squaw Island, the book recants some moments in history about the area and its native American inhabitants. Most important, the story and dialogue hold young readers in suspense until the very end.